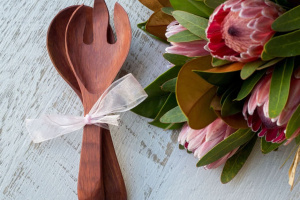 Designed with long handles for ease of use, our Jarrah salad servers have been used by hundreds of customers all over Australia and the feedback has been overwhelmingly positive. 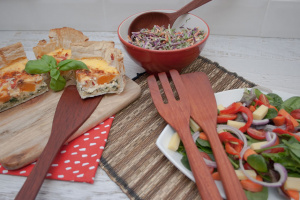 As well as jarrah salad servers, we have jarrah salad hands that are shorter and suitable for a range of salads and serving uses. 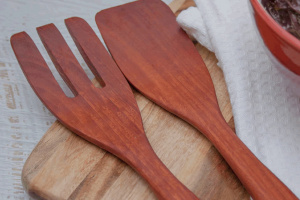 Our jarrah kitchen utensils are made from high display quality feature wood that will not only last for a long time but look great too. 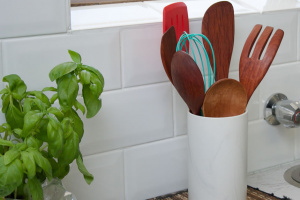 You can purchase these from our online store or visit us at one of the local markets to purchase them today.